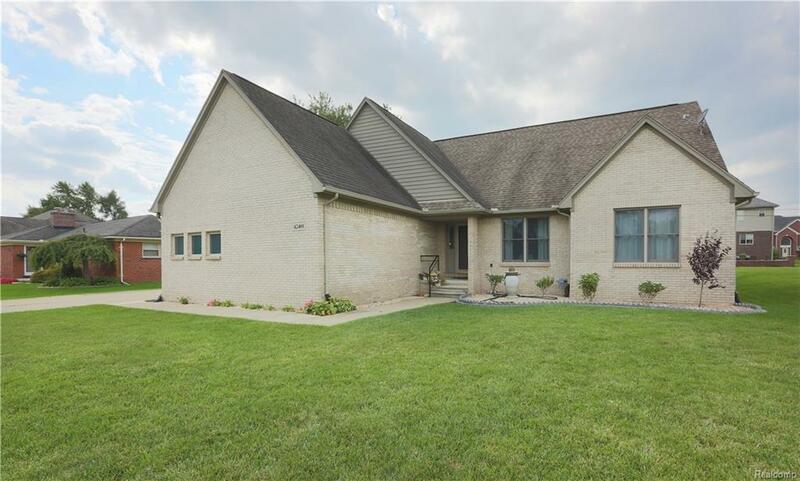 This open-concept, move in ready ranch is warm, inviting and everything you have been waiting for! Very pretty, clean-lined landscaping, makes for easy upkeep. As you enter the home, vaulted ceilings, hardwood floors and a large great room, with gas fireplace, invite you in. To the left, the open kitchen has granite counter-tops and island, stainless appliances, and a large pantry. The laundry room is on the first floor. As you move to the other end of the home, grand size windows beam in light, in the master suite. On chilly nights, enjoy the second gas fireplace from your bed! There are his & her walk-in closets, an exterior sink which is separate from the master bath, with a jetted tub and tiled shower. The huge finished basement is already set up for a great play space and for fitness enthusiasts; including your very own sauna; which is just like new! There is a full bath in the basement and a large deck for outdoor entertaining! This is the ONE!